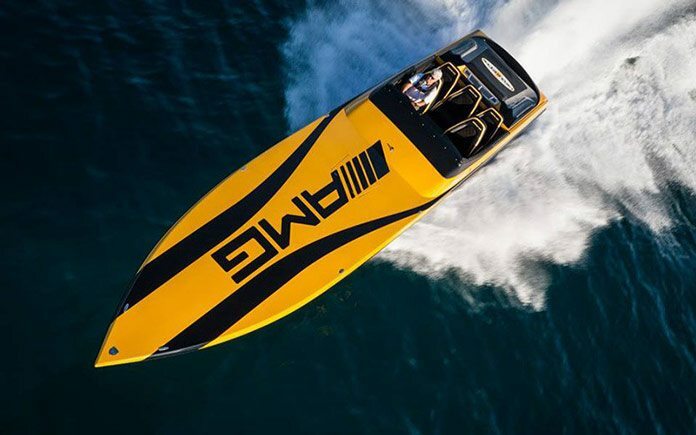 Cigarette Racing 50 Marauder GT S Speedboat is the most powerful production twin engine performance boat currently available. The cooperation of Mercedes-AMG and Cigarette Racing has been in existence since 2007 and is primarily rooted in joint customer and marketing activities. On land and on the water – performance is the element that connects Mercedes-AMG and Cigarette Racing. Nearly every year at the Miami International Boat Show, the two industry leaders launch a new boat that combines Mercedes-AMG styling with Cigarette Racing performance. The 50′ Marauder GT S is the latest collaboration between Cigarette Racing and Mercedes-AMG. Cigarette Racing 50 Marauder GT S Speedboat was designed entirely by Mercedes-AMG and combines agile driving dynamics and top-class racetrack performance with breath-taking design. The front-mid-engine concept and the intelligent aluminium lightweight construction provide the basis for a highly dynamic driving experience. The newly developed AMG twin-turbo 4.0-litre V8 engine underscores the AMG brand claim “Driving Performance”. It produces 375 kW (510 hp) of power and a peak torque of 650 Newton metres. This power pack makes impressive performance possible: the Mercedes-AMG GT S sprints from 0 to 100 km/h in just 3.8 seconds. “With its technological substance the Mercedes-AMG GT S meets our high demands on driving dynamics, agility and performance”, says Tobias Moers, Chairman of the Board of Management of Mercedes-AMG. With styling cues taken from the Mercedes-AMG GT S road car, the 50′ Marauder GT S once again ups the performance and innovation bar. Skip Braver, President and CEO of Cigarette Racing, adds: “We are thrilled to work with the high-performance brand of Mercedes-Benz again this year to develop our fastest power boat to date. With the two new Mercury racing engines inspired by AMG, the 50 Marauder GT S Concept embodies our brand promise of innovation and master craftsmanship“. The Cigarette Racing 50 Marauder GT S Concept is powered by a pair of staggered Mercury Racing 1550 HP engines. The engine bay is painted a stunning AMG Solarbeam colour. Intelligent lightweight construction resulted in weight savings of about 450 kilograms over the standard homologation weight. The power boat is 50 feet long (about 15 metres), eight feet wide (about 2.40 metres), and reaches a top speed of more than 217 km/h. The design and the appointments reflect the dynamic character of the Cigarette Racing 50 Marauder GT S Concept. The exterior sparkles with a black hull and an AMG logo in AMG Solarbeam with matte black highlights. The hand-finished interior is dominated by a black and AMG Solarbeam colour combination with black Alcantara highlights. The design is inspired by the classic Cigarette Racing cockpit. The user interface features state-of-the-art technologies: Bluetooth communication, computer-based control, four high-resolution displays, Garmin and Cigarette navigation, and an audio system of the latest generation. The price for this unique Cigarette Racing boat is USD 1.2 million.